At Dental Studio we offer clients the latest and most advanced treatments available on the market, and now we have added Facelift Dentures to our growing list of services — a denture treatment with a difference. As well as restoring function to the mouth and creating a natural smile, this advanced form of teeth replacement also promises to afford a facelift without the need for any needles or injections. The treatment promises peace of mind, confidence and comfort. They are designed to combat sunken skin and are also the only type of denture to fight against jaw bone resorption. Facelift Dentures stimulate the jaw bone to provide support for the facial structures and create amazing smile aesthetics. Facelift Dentures have been developed based on extensive research and the principles of neuromuscular dentistry. The aim is to create a truly customised denture that provides reliable levels of support and comfort. 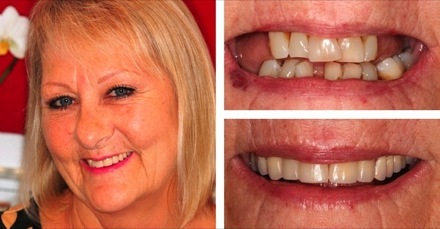 The treatment can make you look and feel younger, and you don't have to worry about uncomfortable or loose dentures. If you would like to find out more about Facelift Dentures, call us today!